Image Below Or Add To Cart .380 Olympic 6 with 2" Black 9MM Blank Firing Gun Replica: The Olympic 6 is a realistic affordable starter pistol. It is also a great dog training pistol and just plain fun! It fires single or double action. The cylinder swings open to accept five rounds. Item Features: Caliber .380 Fires 9MM/380 Blanks, Black Finish with Wood Grips, Single or Double Action, 5 Rounds, Overall Length 8.66” with a 2” Barrel Weighs 13 OZ: This Blank Firing Revolver fires our regular loud 380/9MM Blanks or our quieter 380/9MM Half Load Blanks. The half loads are if you need a quieter shot. You can buy either or both just below here. For the quietest blank gun in a small theatre setting you may want to purchase a 6MM/22 Blank Gun. 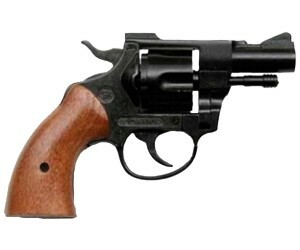 For the quietest blank gun in a small theatre setting you may want to purchase a 6MM/22 Blank Gun.